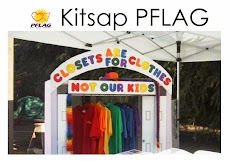 On Sunday February 26th the Kitsap Pride Network, of which Kitsap PFLAG is a part, is sponsoring the Seattle Women’s Chorus for a concert at the Admiral Theater in Bremerton. Through song, the Seattle Women's Chorus examines love in all of its forms: puppy, euphoric passionate, tragic, goofy and those all-too-familiar love/hate relationships. Featuring classics from the Great American Songbook made timeless by vocalists like Ella Fitzgerald, Sarah Vaughn, Tony Bennett and Frank Sinatra. Main Floor Reserved $29; Loge Reserved $19; Balcony Reserved $14.